When mobility equipment is readily available in from Marks Mobility Centre Ltd, there is no reason to not get professional scooter hire to aid with your movement. With prices starting from £5 for half a day and only £84 for a whole week, you can get affordable scooter hire right now. We have a massive range of products, from minor aids to fully motorised scooters to make movement and mobility aid easier than ever before. 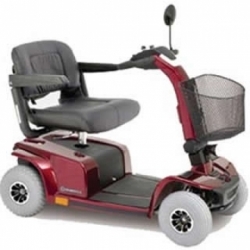 We also stock rise and recline chairs, beds and wheelchairs so that you can never worry about mobility issues again. Throughout the area, we are well-known authorised dealers providing repairs and services for Pride, NHC, First Senior Finances and Days Medical. We provide short and long term contracts so that you can get reliable scooter hire when you need it most. As well as competitive rates we make sure our customers get out of season discounts in the winter months to make scooter hire affordable for everyone. All of our scooters come in various sizes for ease of use and transportation. We have a wide range of small dismantled scooters that can easily be put into your car boot and reconstructed on arrival of destination. Our range also includes pavement scooters in a smaller frame size, chargers and covers where requested. Just like any mobility scooter, there are weight limits. Get in touch to find out more about the model you are looking for. Find out more and call our team on 01255 435 566 to discuss your requirements for scooter hire in .